Native to Australia, naturalized in New Zealand and California. Occurs in 3 counties according to Calflora. In California, Rytidosperma caespitosum is abundant along road shoulders and utility corridors on Sweeney Ridge and in fuelbreaks on adjacent SFPUC lands. On Golden Gate NRA lands, we have mapped 29 gross acres, and 1.2 net acres, mostly in linear distributions along roads. There is probably an equal or greater amount on the adjacent SFPUC lands (Eric Wrubel, pers. comm.). NZBH (0). New Zealand Virtual Herbarium - Home. Wrubel, E. (2016). Personal communication from Eric Wrubel, Network Botanist San Francisco Bay Area National Parks Inventory & Monitoring Program. Native to Australia, naturalized in New Zealand and California. Question is marked yes because it is naturalized in California. None of the 16 species of Rytidosperma listed in Randall (2012) are classified as invasive. However, recent information indicates that R. penicillatum is invasive in California and is listed on the Cal-IPC inventory. "R. caespitosum, and the closely related R. penicillatum are effective colonizers after disturbance, and dense populations can inhibit colonization by other perennial grasses and forbs through a buildup of thatch, especially with continued disturbances such as mowing or grazing. These two species are clearly spread by mowing, and can form long, linear populations along transit corridors. They can be spread away from roads and trails by grazing and wildfire (fire fighting activites). I would say that with disturbance, both species can displace native plants and dominate communities through rapid colonization and inhibition. I have not yet seen much evidence of this species colonizing undisturbed native vegetation. However, wildfires are part of the natural disturbance regime where R. caespitosum occurs, and I would expect to see a dramatic expansion of this species following a wildfire, where there is adequate propagule pressure. This is what happened with R. penicillatum at Point Reyes, where it now infests hundreds of acres in the footprint of the Vision Fire, and after a fire at POST Cloverdale Ranch in San Mateo Co. (Eric Wrubel, pers. comm.)" Health, T. University, & Service N. Park (2015). Invasive Plant Atlas. R. caespitosum's native range matches California's climate in part, and is estimated to be a greater than 50% match. California's climate does not match the distribution in Tasmania and New Zealand. There is no information on whether R. caespitosum promotes or changes fire regimes. However, it was noted by Eric Wrubel, GGNRA, that a closely related species, R. penicillatum, was able to spread after a wildfire. R. caespitosum is not poisonous and has not been shown to impact grazing systems. In its native range in Australia it is considered one of the most valuable native pasture grasses. The Plant Information Network System of The Royal Botanic Gardens, Domain Trust (0). PlantNET - National Herbarium of New South Wales. R. caespitosum is a perennial grass which grows to 80 cm tall and would not form impenetrable thickets or block movement. Darbyshire, S. J., Connor H. E., & Ertter B. (2010). The Genus Rytidosperma (poaceae) in the United States of America. Journal of the Botanical Research Institute of Texas. 4, 663–676. R. caespitosum is a bunch grass so it would not spread vegetatively. 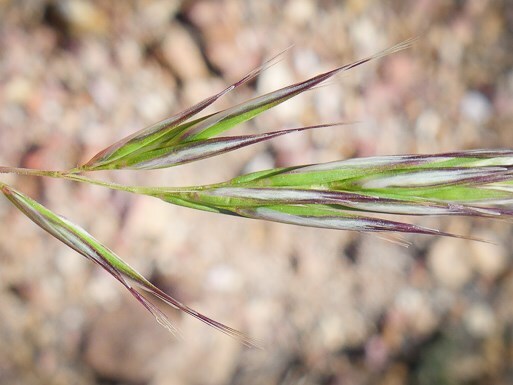 R. caespitosum is a perennial grass which is thought to spread mostly by seed. R. caespitosum produces viable seed in its native range, and is also thought to be spreading by seed in California. Stevens, J., Chivers I., Symons D., & Dixon K. (2015). Acid-digestion improves native grass seed handling and germination. Seed Science and Technology. 43, 313–317. Waters, C. (2009). Factsheet - Wallaby grass (Austrodanthonia caespitosa). Information is available on the seed production by weight of other species of Rytidosperma (formerly Danthonia), but the weight of individual seeds is not included (Lodge 1993). There is no information available on the number of seeds produced per year by R. caespitosum. Lodge, GM. (1993). The domestication of the native grasses Danthonia richardsonii Cashmore and Danthonia linkii Kunth for agricultural use. I. Selecting for inflorescence seed yield. Australian Journal of Agricultural Research. 44, 59–77. In its native range, wildland harvested seed of R. caespitosum has high viability (60-80%). Waters (2009) states that the species is a relatively short-lived perennial (perhaps < 2 years), which means the seed would have to be produced in the first year. In California it flowers from June to July, so it would not be producing seed for 3 months or greater in California (Eric Wrubel pers. comm.). However, in its native range in Australia it flowers opportunistically in response to rainfall. Main flowering in autumn, secondary flowering spring but will also flower periodically throughout the year (Waters 2009). R. caespitosum lacks a pappus for wind dispersal and seeds are larger than those usually dispersed by wind or water. The most likely dispersal mechanism of R. caespitosum is by deliberate planting, or by dispersal along roads and trails by vehicles or humans. Rytidosperma caespitosum is abundant along road shoulders and utility corridors on Sweeney Ridge and in fuelbreaks on adjacent SFPUC lands. On Golden Gate NRA lands, we have mapped 29 gross acres, and 1.2 net acres, mostly in linear distributions along roads. There is probably an equal or greater amount on the adjacent SFPUC lands. I am cc'ing Don Thomas, the SFPUC IPM specialist, who may know more about the distribution on their lands. R. caespitosum, and the closely related R. penicillatum are effective colonizers after disturbance, and dense populations can inhibit colonization by other perennial grasses and forbs through a buildup of thatch, especially with continued disturbances such as mowing or grazing. These two species are clearly spread by mowing, and can form long, linear populations along transit corridors. They can be spread away from roads and trails by grazing and wildfire (fire fighting activites). I would say that with disturbance, both species can displace native plants and dominate communities through rapid colonization and inhibition. I have not yet seen much evidence of this species colonizing undisturbed native vegetation. However, wildfires are part of the natural disturbance regime where R. caespitosum occurs, and I would expect to see a dramatic expansion of this species following a wildfire, where there is adequate propagule pressure. This is what happened with R. penicillatum at Point Reyes, where it now infests hundreds of acres in the footprint of the Vision Fire, and after a fire at POST Cloverdale Ranch in San Mateo Co. (http://calphotos.berkeley.edu/cgi/img_query?enlarge=0000+0000+0408+1847 ).